In this article, I'll share the science of sleep and how it works, discuss why many people suffer from sleep deprivation without knowing it, and offer practical tips for getting better sleep and having more energy. First, sleep debt is a cumulative issue. Second, participants didn't notice their own performance declines.When participants graded themselves, they believed that their performance declined for a few days and then tapered off. In reality, they were continuing to get worse with each day. In other words, we are poor judges of our own performance decreases even as we are going through them. In the real world, well-lit office spaces, social conversations, caffeine, and a variety of other factors can make you feel fully awake even though your actual performance is sub-optimal. You might think that your performance is staying the same even on low amounts of sleep, but it's not. And even if you are happy with your sleep-deprived performance levels, you're not performing optimally. Light probably the most significant pace setter of the circadian rhythm. Staring into a bright light for 30 minutes or so can often reset your circadian rhythm regardless of what time of day it is. More commonly, the rising of the sun and light striking your eyes triggers the transition to a new cycle. The time of day, your daily schedule, and the order in which you perform tasks can all impact your sleep-wake cycle. This is the hormone that causes drowsiness and controls body temperature. Melatonin is produced in a predictable daily rhythm, increasing after dark and decreasing before dawn. Researchers believe that the melatonin production cycle help keep the sleep-wake cycle on track. If you're having trouble falling asleep, eliminating caffeine from your diet is a quick win. If you can't go without your morning cup of coffee, then a good rule of thumb to keep in mind is “No coffee after noon.” This gives caffeine enough time to wear off before bed time. Tobacco use has been linked to a long line of health issues and poor sleep is another one on the list. I don't have any personal experience with tobacco use, but I have heard from friends who have quit successfully that Allen Carr's Easy Way to Stop Smoking book is the best resource on the topic. Is your bedroom designed to promote good sleep? The ideal sleeping environment is dark, cool, and quiet. Don't make your bedroom a multi-purpose room. Eliminate TVs, laptops, electronics, and clutter. These are simple ways to improve the choice architecture of your bedroom, so that sleep is easier and distraction is harder. When you go to the bedroom, go there to sleep. There are too many benefits to exercise to list them all here. When it comes to sleep, exercise will make it easier for your brain and body to power down at night. Furthermore, obesity can wreck havoc on your sleep patterns. The role of exercise only becomes more important with age. Fit middle-aged adults sleep significantly better than their overweight peers. One caveat: avoid exercising two to three hours before bedtime as the mental and physical stimulation can leave your nervous system feeling wired and make it difficult to calm down at night. Most people sleep best in a cool room. The ideal range is usually between 65 to 70 degrees Fahrenheit (18 to 21 degrees Celsius). A quiet space is key for good sleep. If peace and quiet is hard to come by, try controlling the bedroom noise by creating “white noise” with a fan. Or, use ear plugs (here's a good pair). This one is a slippery slope. It is true that having a drink before bed — a “night cap” — often does help people fall asleep. However, while it makes it easier to fall asleep, it actually reduces the quality of your sleep and delays the REM cycle. So you fall asleep faster, but it's possible that you'll wake up without feeling rested. It's probably best to improve your sleep through other methods before resorting to alcohol to do the job. The body loves ritual. 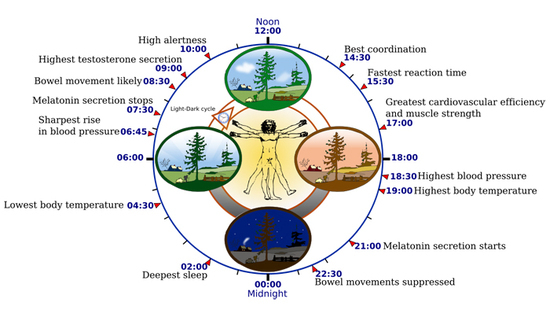 The entire circadian rhythm we laid out earlier is one big, daily routine. Go to bed and wake up around the same time each day. Develop a “power down” ritual before bed. Researchers believe that at least 50 percent of insomnia cases are emotion or stress related. Find outlets to reduce your stress and you'll often find that better sleep comes as a result. Proven methods include daily journaling, deep breathing exercises, meditation, exercise, and keeping a gratitude journal (write down something you are thankful for each day). Generally speaking, one nap in the early afternoon is the best way to adding napping to your sleep cycle. This is particularly useful if you aren't getting enough sleep each night as your body may be able to make up the deficit during your nap. Drink a large glass of water in the morning. Your body just went 6 to 8 hours without any liquid. If you are feeling lethargic and groggy in the morning, you may often be slightly dehydrated. The first thing I do when I wake up is drink a large, cold glass of water. Start the day in the sunlight. 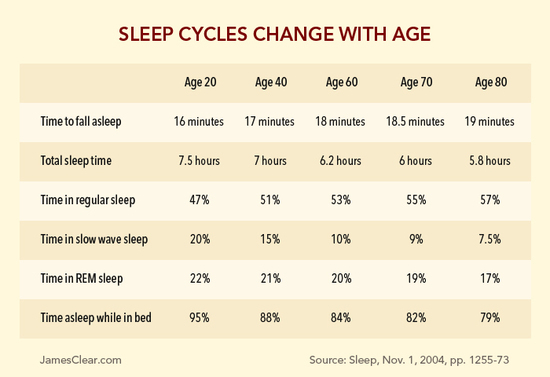 The ideas in this article offer a variety approaches on how to get better sleep. If you're looking for more practical strategies on how to create better sleep habits (or better habits in general), then read my free 46-page guide called Transform Your Habits or browse my best articles on behavior change and habit formation.